The Diplomat speaks with Jonathan Watts about his book ‘When a Billion Chinese Jump’. Can the world survive Chinese growth? The environmental situation in China is anything but simple. ‘China is a 3000-year-old civilisation in the body of an industrial teenager; mega-rich, dirt-poor, overpopulated, under-resourced, ethnically diverse mass of humanity that is going through several stages of development simultaneously,’ writes Jonathan Watts in his upcoming book ‘When a Billion Chinese Jump.’ Based on his seven years of experiences as The Guardian’s Asia environmental correspondent and seven months’ travelling to almost every corner of China, Watts tries to make sense of the environmental state China is in, and what this means for the rest of the world. The Diplomat contributor Brian Chapman spoke with Watts about his book—part reporting, part travelogue—about the dark reality of the country’s factory pollution, cancer villages, species loss and emissions hazards. And about what China can do to make its growth green and sustainable. Many of the articles you’ve written recently for The Guardian are tied closely to the subjects you cover in the book. What prompted you to write a book on the subject, rather than just continue reporting? I think the trend in my career has been towards spending more time on longer stories. When I was in Japan, I’d be doing three or four stories a week, just as I was in China. After I moved to China in 2003, I found myself doing a lot more long, feature travel journalism stories. I think China does that to you because it’s so big—it’s so fast-moving that you capture that sense of motion and scale. It helps to have a bit more space, and during the course of the story to try and cover quite a lot of ground to show the diversity of the place, which often gets lost when you do single stories on a day-to-day basis. In your book you seem to start off quite pessimistically about China’s environment, but by the end, you have an almost optimistic tone. I think there are huge mood swings when you cover China. You can see things that just totally depress you and huge setbacks for people who seem to be thoroughly decent people trying to do the right thing to improve their lives and improve society. But they end up sometimes getting locked up for upsetting somebody in power or falling victim to some kind of accident. And then you can also see amazing improvements in people’s lifestyles and really huge ambitions. I think the same for the environment. 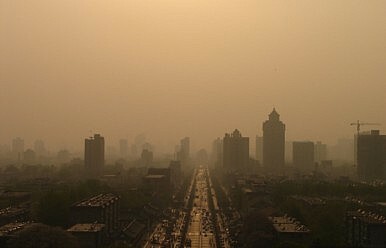 China’s environmental crisis is worse than most people realize. But at the same time, I think China is doing a lot more to try and tackle those problems than people outside of the country realise. China's Goals for 2014Xi Jinping and the Third Chinese RevolutionTaiwan's Elections: What to Watch ForWhat Does the Ma-Xi Meeting Mean for China, Taiwan and America?U.S.-China Relations: What Now?